Wow. This beer is awesome. I usually find it in the store once a year around December. My first encounter with it was at a friends house. He opened one bottle for four of us to share. It is delicious. Every once in a while I have one when I find it somewhere. I have been trying to buy it once a year when I see it (it is like $8ish a bottle) and put it away to let it age. I had never dipped into my stash until … the other night I had a friend over and found a bottle from 2010 that I had been saving. It had been a gift from my friend (that I mentioned before) in 2012 for my 30th birthday. I can’t give it enough words of praise. It aged beautifully. It was creamy and smooth, without too much of a bite. Go buy some and put it somewhere and forget about it for 5 years. You will thank me. Last night my friend David and I made a batch, aiming for an IPA. I have tried and failed many times to make an IPA. They were never bad, they just didn’t taste at all like they should. I’ve tried recipe’s and I have even tried kits. Nothing…. The plan involves a total of 12 oz. of hops. I know, that is crazy! That would normally be about $50 of hops, however, David went to the newish beer store The Green Growler and everything was half off. Time to find out if not enough hops has been my problem all along. 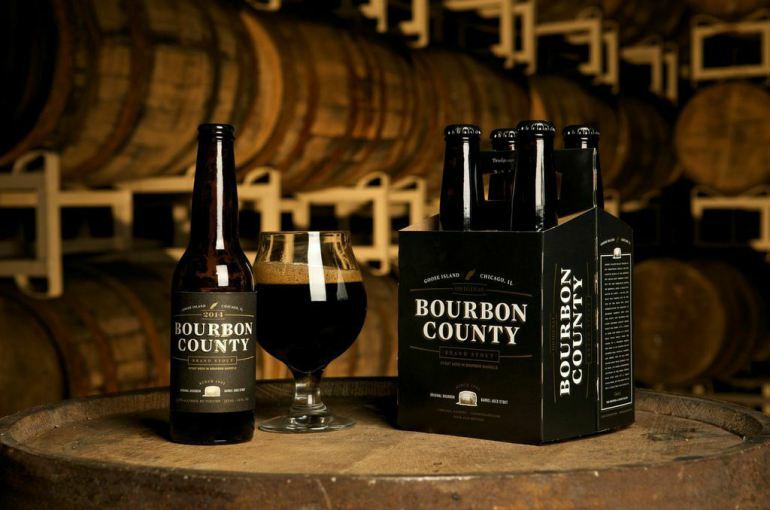 I found this on an awesome blog(http://beerandwhiskeybros.com/)….. I would like to say I am Craftus Erectus. Where are you? 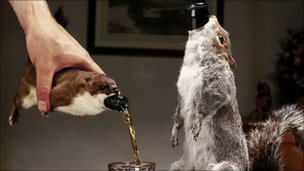 I know that Tactical Nuclear Penguin (BrewDog’s first “world’s most alcoholic beer”) achieved its glory by freezing the beer to remove water to make it more alcoholic. Remember taking your parents vodka that was in the freezer, drinking it and adding water so they wouldn’t notice? Then it froze and they caught you … Well, water and alcohol have different freezing points. Alcohol freezes at a much lower temperature than water does. It freezes at -114 °C. Water freezes at 0°C. This means you can bring the temperature down to say, -50°C’ish and presto! Take out all the ice and you are left with nothing but some slightly watery alcohol. Now I don’t think I would be able to easily replicate this experiment in my home but that is the basic science behind it. So the moral of the story is that next time you are in Scotland and have £500 to spare, perhaps you should (attempt to) enjoy some cold “beer” wrapped in a dead animal. Trust me. Both of these are special. I was transferring a batch of beer into a carboy last night and when I was finished I found something wrong… I had dropped my Thermohydrometer (basically a glass weirdo buoyancy device) into my wort (unfermented beer) and I heard a crack. 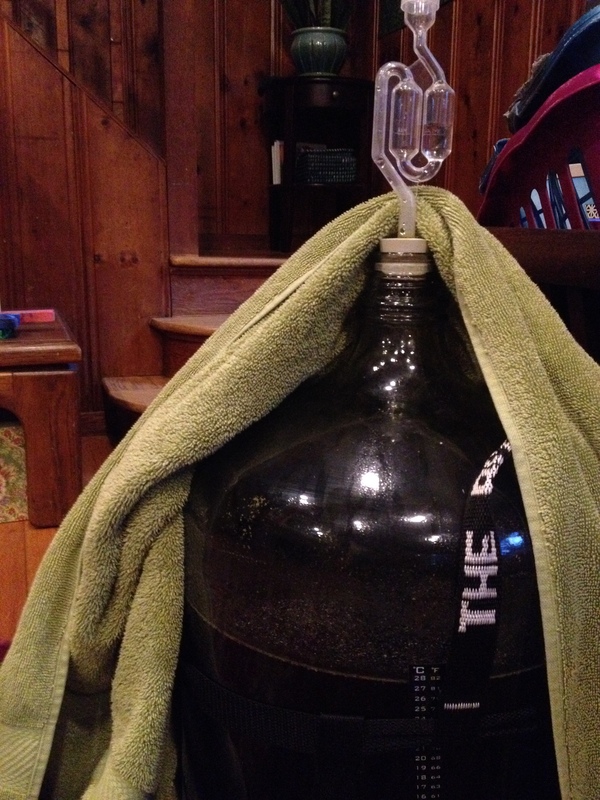 I hoped for the best until I siphoned all the beer into a clean carboy for secondary fermentation. Unfortunately it had broken and now I don’t know what to do about it. Here is a picture of my broken device. 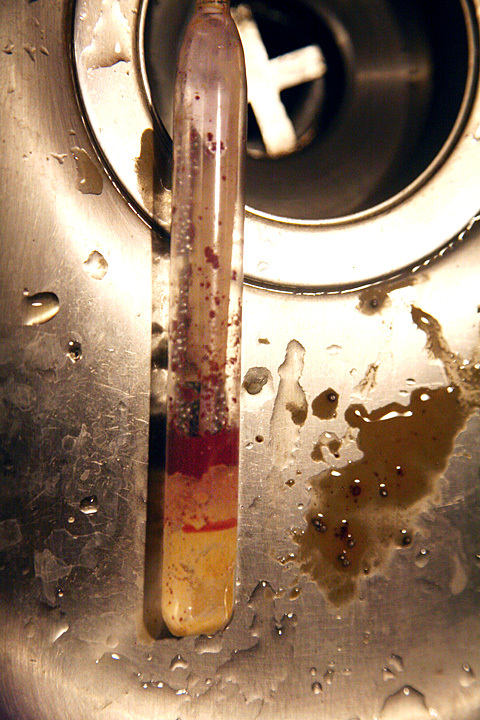 I am not too worried about the ball bearing type things… just the red dusty stuff that I have no idea what it is… Most of the yellow stuff is spent yeast and not harmful at all. You can see in the picture that it got inside the big hole (which you can’t see so well) in the bottom. This must have happened to someone else out there. Is my beer poisoned? Do I have anyone who will volunteer to test it?